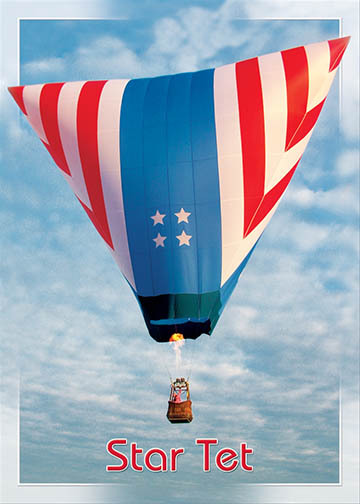 © Keith Sproul This balloon design, this web page, and this documentation are copyright © 2006 - 2012 by Keith Sproul. 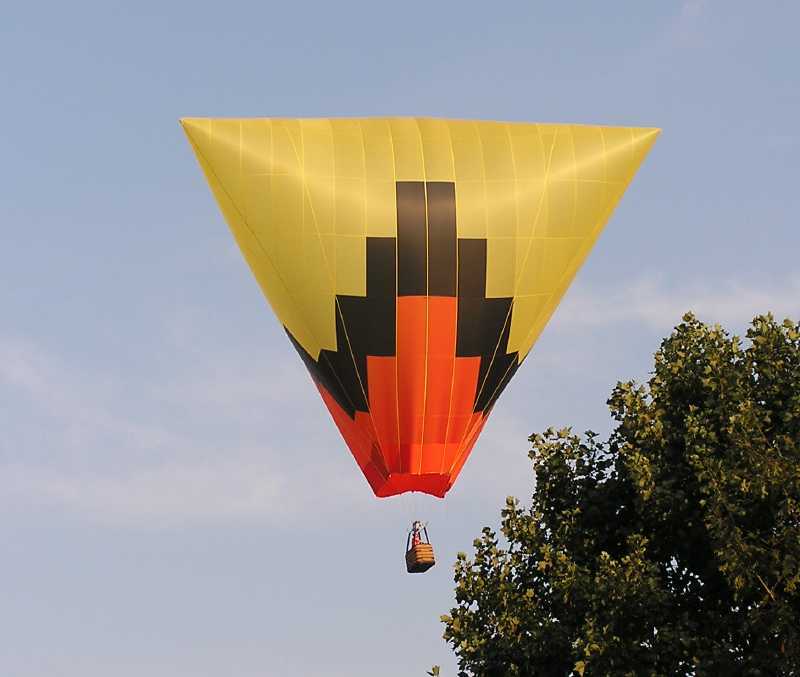 This site is aimed at people who have already made hot air balloons and are interested in making Tetrahedron shaped hot air balloons. If you have questions, or suggestions on things that should be added, PLEASE let me know. This is a work in progress. A Tetrahedron is the simplest three-dimensional object there is. It has 4 points, that is it. 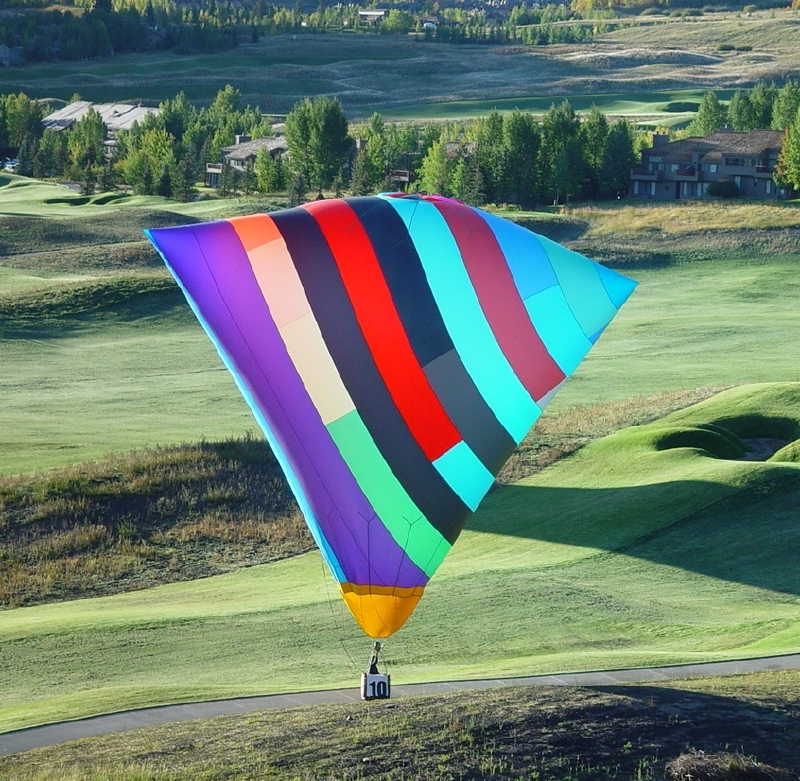 There are three completely different ways to make a Tetrahedron Hot Air Balloon. I am sure there are even more, but this documentation will discuss these three methods. 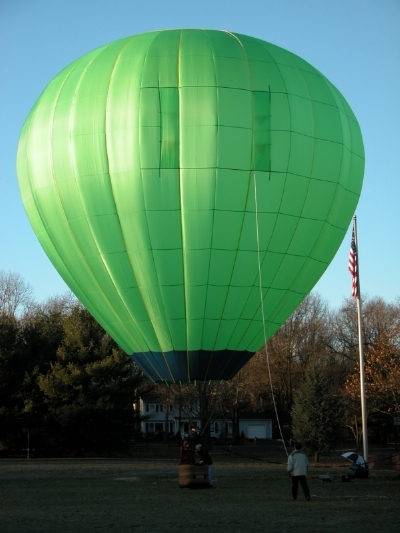 To make any hot air balloon is a large project. However, it isn't as huge as you might think. 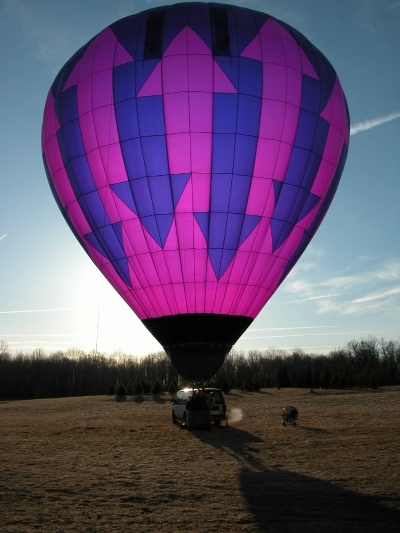 Depending on complexity, size, and design, a hot air balloon may take from 100 to 500 hours. 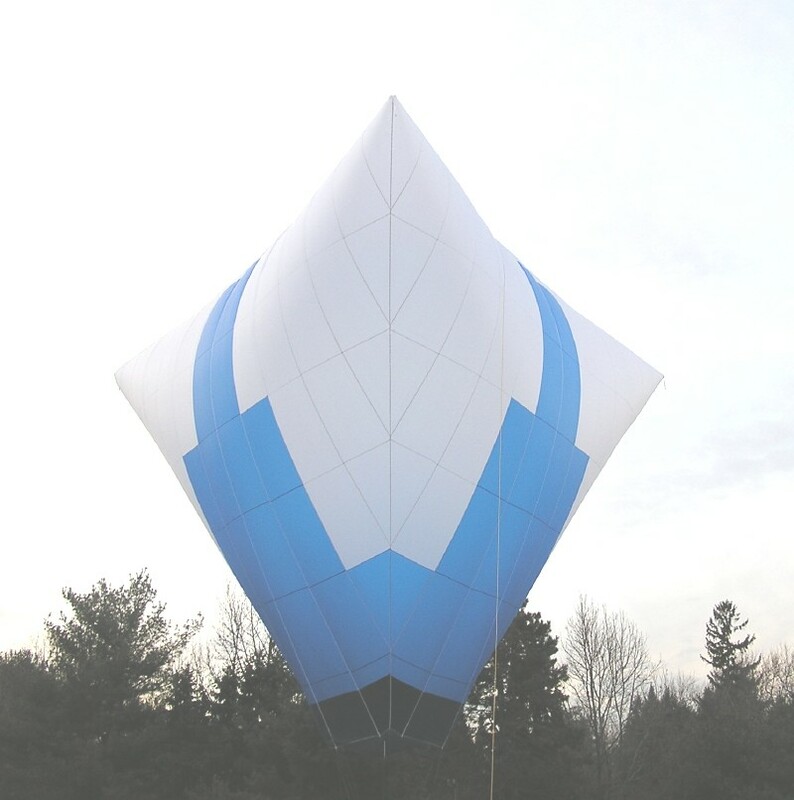 Making a Tetrahedron hot air balloon is somewhat simpler than making a normal round balloon. If you use the CYLINDER method, it can even be easier, however this method has other draw backs and I recommend against this method. What are you going to use the balloon for? How many people do you want to be able to carry? What type of basket do you plan to use? If using the VERTICAL GORE METHOD (my favorite), there is a very efficient way to make the panels. By making the height of each panel based on the width of fabric, you can reduce the amount of effort, especially when it comes to cutting panels. 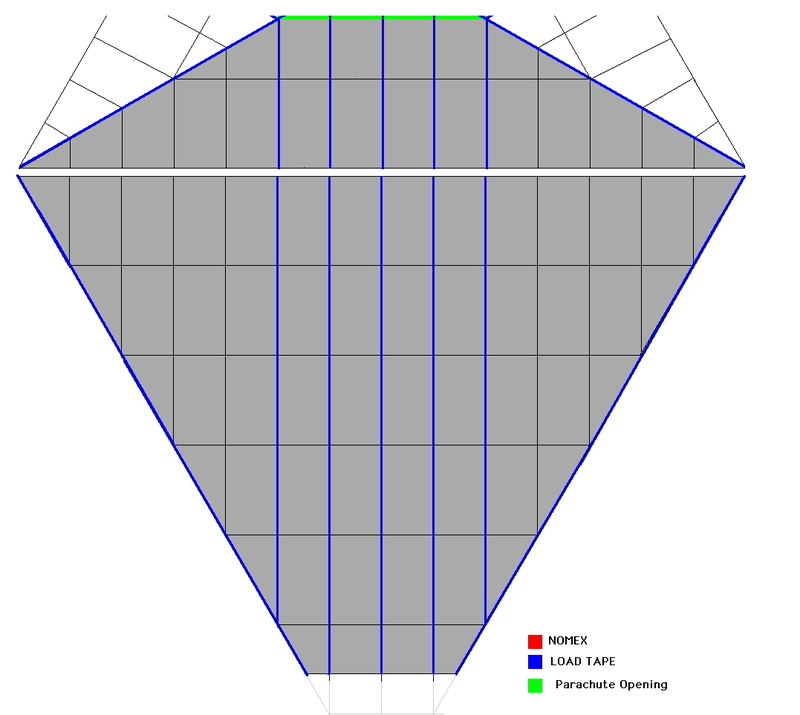 The angle in a tetrahedron is 60 degrees. If you make the panel height to width ratio such that you would end up with a 60 degree triangle, you can make your job much much easier. With this method, all you need is 200 to 400 panels, all the exact same size. This makes cutting easy (although somewhat boring after awhile). This calculation has to be done on the FINISHED size, then add the seam allowances. Advisable to cut all panels before starting to sew. The top panels are sewn onto the side panels as one continuous vertical piece. Install 2 on load tapes about half way up side. Take your time, be careful. Use basic geometry to determine the lengths of the load tapes. Overlap the load tape by 24". Sew at least 4 passes over the load tape. Lots of small things to do here. Attach the V-Rings. Put a second layer of load tape up 24" inside and outside of the envelope. Take it slow. Check everything, especially parachute centering lines. FAA requires a flight manual. 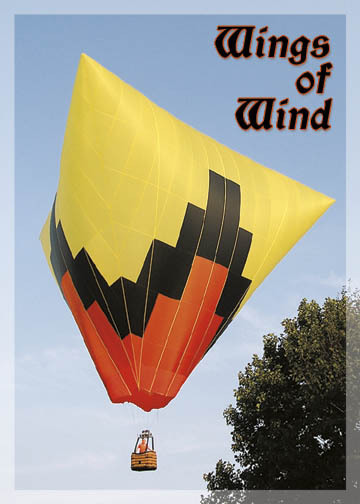 Look at other balloon manuals. Keep it simple. Don't put in any undo restrictions. Make your options flexible. Remember, If it is in the manual, it is probably okay. DAR (Designated Airworthiness Representative) of FAA direct. You have a triangle shaped parachute. How does this compare? The triangle shaped parachute is a LOT easier to make, looks neat, and behaves no different than normal parachutes. How are the climbing and descending characteristics of the envelope? I have found that it spins on rapid rise and descent. Other than that, it is just fine. I have had it up to 600 fpm up and 600+ fpm down. Never any problem. I don't think I would want to go above 1000 fpm down. With the flat top, it is hard to go much faster up anyway. Any issues on hot inflation? I highly recommend having a rope on the top corner and having someone 'PULL' you up. If you don't do this, any breeze will catch the corner and twist you QUICKLY. This person works in conjunction with your crown-line person. They play a gentle game of tug-of-war. The windier it is, the harder this top-line person has to work. They also have to pay attention to try to keep the point directly into the wind. Do you have any issues with carrying passengers in this design? None what so ever. What about glowing or tethering? Each corner has a loop to attach a rope. I leave a rope on the top corner for hot inflation (see question above). 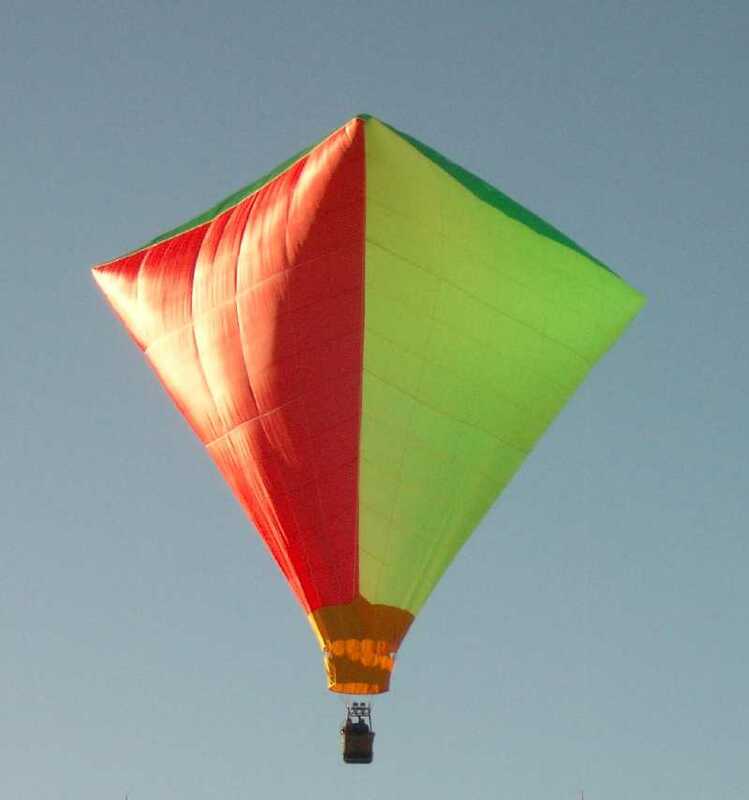 If I am going to glow or tether, I fasten ropes onto the other two corners so that I can have people on all three corners hold me down during the glow. NOTE: These ropes should be light weight ropes. They will pull the corner down a little. Heavy ropes will pull the corners down a lot.